Gotta say - this is one of my favourite cards. I wanted to do with them. my alcohol pens... just about every brown, in every type of pen I have! is that you get separate images... 6 in all. The stamped sentiment is from Inkylicious. To finish the card, I dry embossed the edges. Beautiful card, Vic! 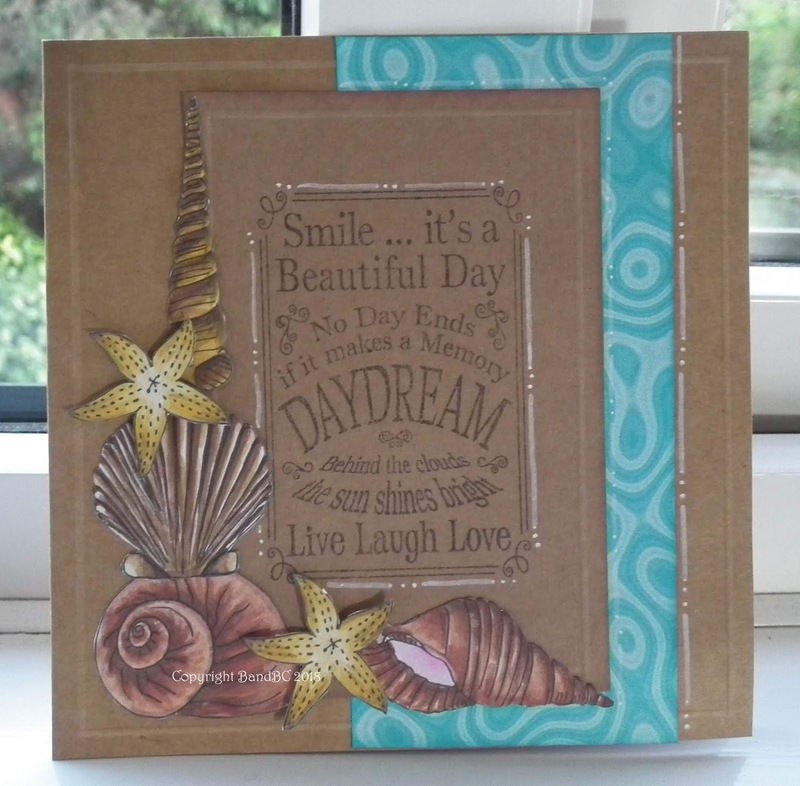 I love the natural colours of the kraft card and the blue DP and the shells are wonderfully coloured! Thank you for sharing your project with us at the Crafts Galore Encore “Anything Goes” July Challenge. Good Luck and hope to see you again next month! Fabulous nautical card and a great design! Thank you for joining our challenge at Double D! Oh Vic this is so, so pretty! FANTASTIC!!! Thanks so much for joining in the fun at our Double D ‘Nautical’ challenge! Good Luck and we hope you’ll come back often. A super card, thanks for joining in our challenge at Passion for Promarkers this week. Beautiful card love the colours. Those shells are beautiful and beautifully colored and arranged! Love the brown and blue with them. You should be very proud of this card! Thanks for sharing with us at Double D! This looks amazing, a big favorite of mine. I love the design, the colour combo and those pretty shells. This is fabulous! Love the shell touches! Thanks for joining our weekly challenge at QKR Stampede! I'm not surprised you loved the shells. lovely card. Thank you for joining in the QKR Stampede challenge this week. Hi, back again but this time for Scribbles Design Challenge. I love the craft and teal, they work so well together. Also love that big focal sentiment you used and your doodling. All looks great! Hello… Thanks for entering your lovely card into the ‘Anything Goes’ challenge at Scribbles Designs… great sentiment too... please join us next time and Good Luck in the draw. Thank you for playing along with us at Creative Sketchy Girls Challenge. Yesterday we started a new challenge, maybe you want to join us now also. This is gorgeous!!! Wow! those seashells are fabulous and the turquoise paper really makes everything pop!! Thanks for playing with Jo's Scrap Shack and LTSCB. Sorry I'm sooooo late in commenting; life got busy! !